Please consider this an official public comment on the proposed Cherry Point Amendments to the 2016 County Comprehensive Plan Update, currently under review by the Council. I would like to bring some information to your attention regarding public commenting on the Cherry Point Amendments. That sponsored Facebook ad has come into my Facebook feed, and other Whatcom County residents’ Facebook feeds on multiple dates this month. Oddly, when I went to the WBA Facebook page, the February 20, 2017 post that is featured in the sponsored ads does not appear on WBA’s page. That likely indicates that the post was hidden by the WBA Facebook page so that only the page administrator/s can see it, but the public can not see it. One might wonder why an organization would want to create a post, then send it out as a sponsored ad multiple times, but then make it so that post would not be visible to the public visiting the organization’s Facebook page? Perhaps the answer to that question can be found by examining that Facebook post sponsored ad. 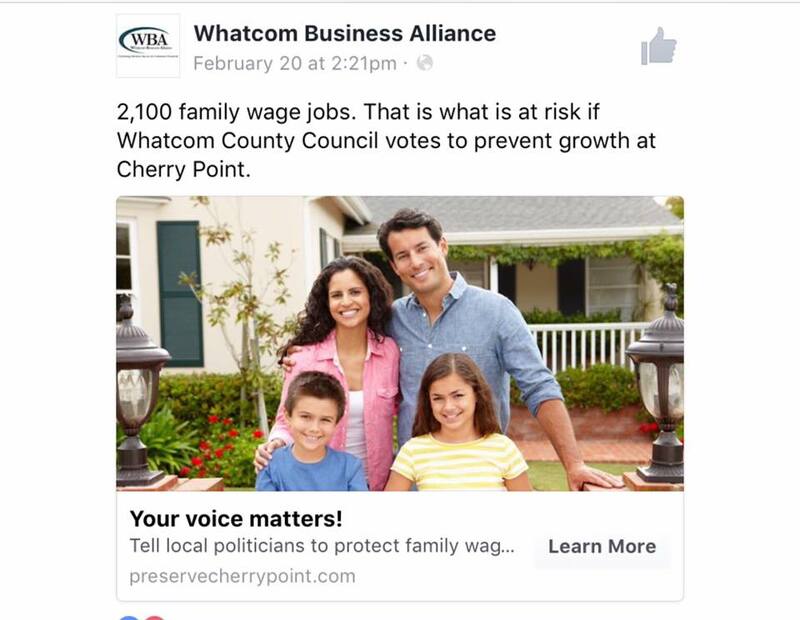 The link in the WBA’s February 20th-dated Facebook page post takes people to a webpage (“preservecherrypoint.com“) showing the WBA logo at the top, with information displayed, a request that visitors “Take Action,” and ultimately a form-generated comment directed to the County Council, regarding the Cherry Point Amendments. I will discuss the specifics of the “Action” the WBA wants people to take after I first discuss the propaganda that was/is fed to people before they would move/scroll down that webpage to then submit their form-generated communication. “The study written into the Cherry Point UGA amendment is the first step in the County Council’s attempts to harm Cherry Point stakeholders and it will have a severe impact on their ability to be flexible, grow, create new family-wage jobs, and fund education and other important social services. 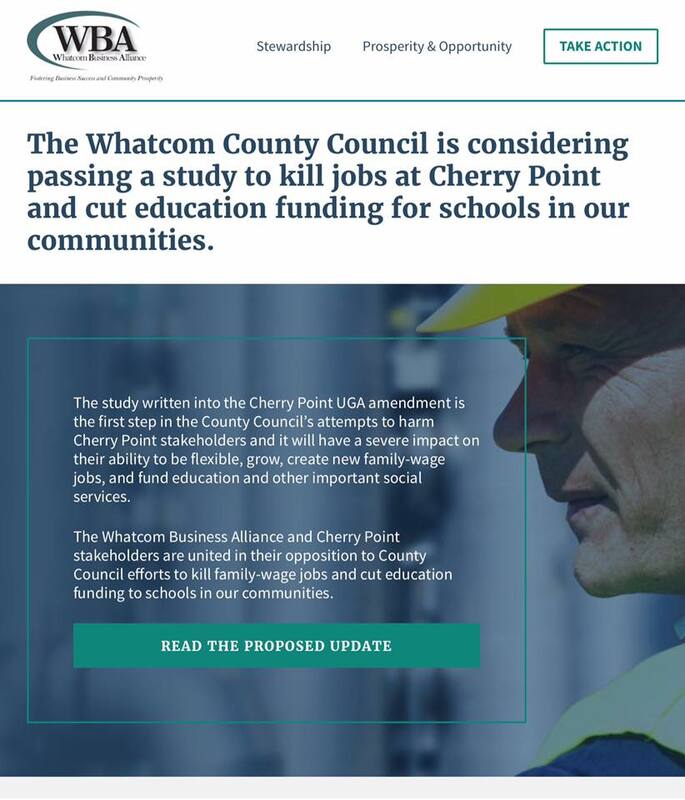 Below those two paragraphs there is a link that says, “Read The Proposed Update,” which, if clicked, takes visitors to a document containing both the County Planning Commission’s “Findings of Fact and Reasons for Action” and the commission’s “Final Recommendations” on the Cherry Point Amendments it approved on January 12, 2017. In terms of the “Action” that the WBA asks visitors to its “preservecherrypoint.com” webpage, to take, first, I’d like to be clear in stating that I do not have a problem with the idea of form-generated comments often used by various organizations. I understand the positive aspects of that practice when conducted in a responsible and accurate manner by organizations. However, I do have a problem when an organization, in its zeal to impassion and/or motivate people to take action to submit comments which were form-generated by that organization, feeds information that can easily be described as propaganda, and at best, is inaccurate and misleading, to the audience at which it is directing its comment campaign. 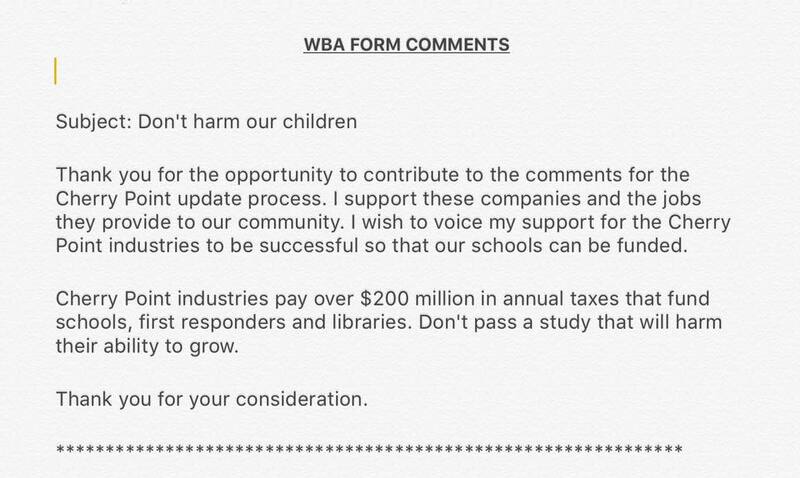 Now, onto the specifics of the “Action” that WBA asks/encourages readers to take. 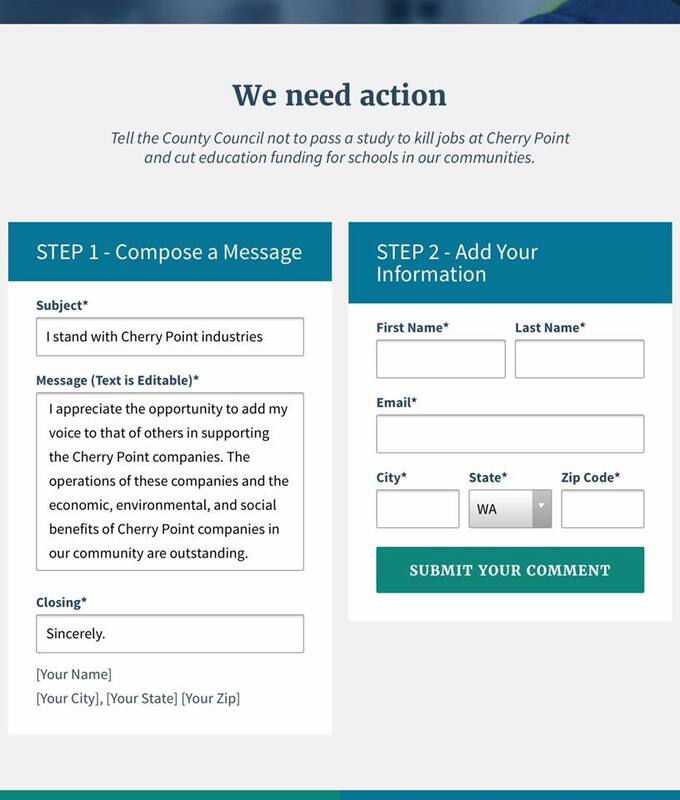 The “Action” requested is to fill-out and submit a pre-written, form-generated comment that is directed to the County Council, regarding the proposed Cherry Point Amendments to the County Comprehensive Plan Update. The first section shown is “Step One – Compose a Message,” under which there is a pre-written subject line, a pre-written message, and a pre-written closing line. Under the closing line, it shows that a commenter’s name, city, state, and zip code will appear there, after the close. 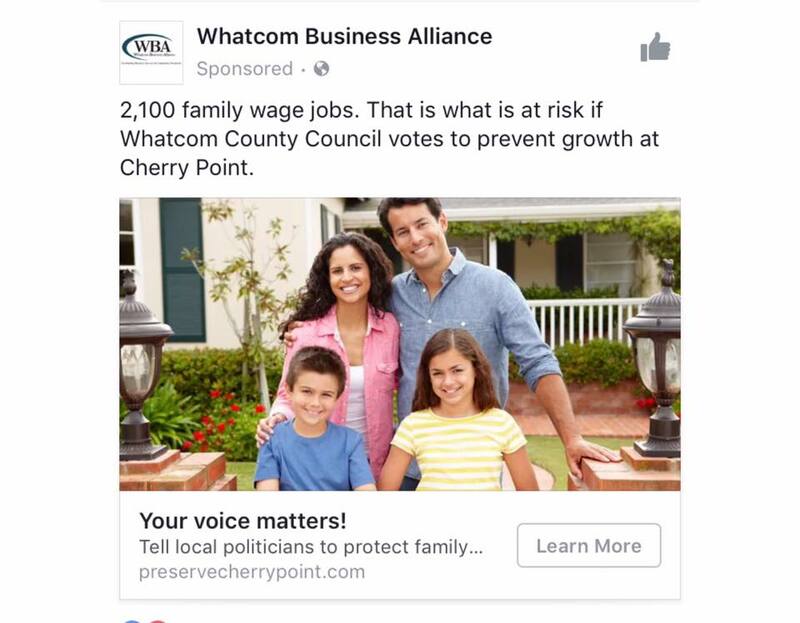 After receiving the sponsored ad in my Facebook feed this week, I have visited the WBA’s “preservecherrypoint.com” webpage about 30 or so times. The form-generated communication is somehow set up so that the “Subject,” the “Message,” and the “Close,” for those comments/communications to the Council will periodically vary, such that the form comment that people will be sending will be presented in at least 22 differently worded versions (seen so far) depending on which version was presented on the WBA webpage according to when people visited the webpage. I felt it important to have provided Council with the information I have outlined here so that you all have a full understanding of the context in terms of exactly what information that WBA fed to people who responded, and are responding, to their organization’s sponsored Facebook ads, who took action to submit the form-generated comments to the Council. I hope that you keep all of this in mind when you read any of the WBA form-generated comments I’ve described because there are at least 22 different versions with various subject lines above them, but all of those comments/communications stemmed from the same inaccurate and misleading information provided by the WBA on its “preservecherrypoint.com” webpage. And, that inaccurate and misleading information gave those commenters a specific framing of the Cherry Point Amendments proposal, with particular emphasis on alleging that the study referenced in the proposal is the “first step in the County Council’s attempts to harm Cherry Point stakeholders,” and that there are “efforts to kill family-wage jobs” and “to cut education funding for schools in our community” by the County Council. Those various 22 comments/communications are each shown at the bottom of this email. You can also see examples of some of those in screenshot photos attached at the bottom of this email. Thank you for considering my comment on this matter. This text graphic and others in the collage below are representative of text provided by the WBA in a variety of form-generated comments that can be submitted to the County Council by visitors to the preservecherrypoint.com webpage. The text displayed in the form on the webpage seems to change every 5 minutes or so when the webpage is refreshed. This entry was posted in Commentary, Facebook Post, Information, Letter and tagged Cherry Point Amendments, Cherry Point Aquatic Reserve, Cherry Point Industrial Area, Cherry Point Industries, Cherry Point UGA, Comp Plan, Comprehensive Plan, Comprehensive Plan Comments, Family Wage Jobs, Form-generated comments, Policy 2CC-15, Policy 2CC-16, Tony Larson, Urban Growth Area, WBA, Whatcom Business Alliance, Whatcom County Council. Bookmark the permalink.